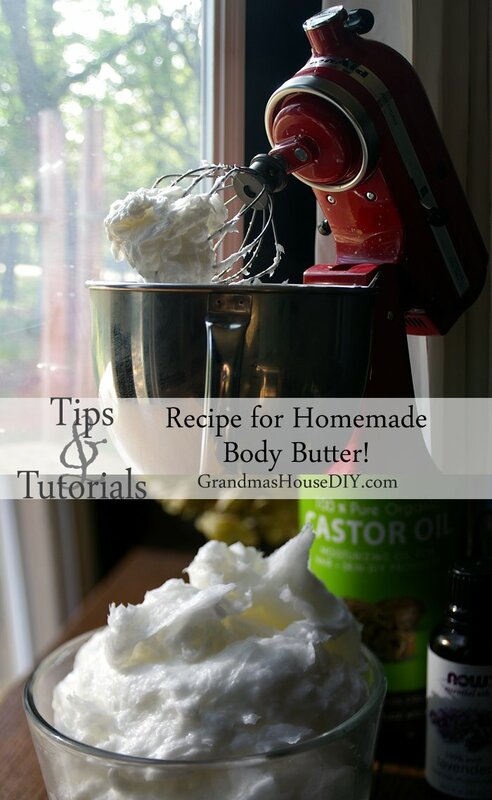 I got to experimenting a couple of years ago, attempting to create my own homemade recipe for body butter. I knew I wanted to use coconut oil but I wanted to use the LEAST amount of ingredients as possible. 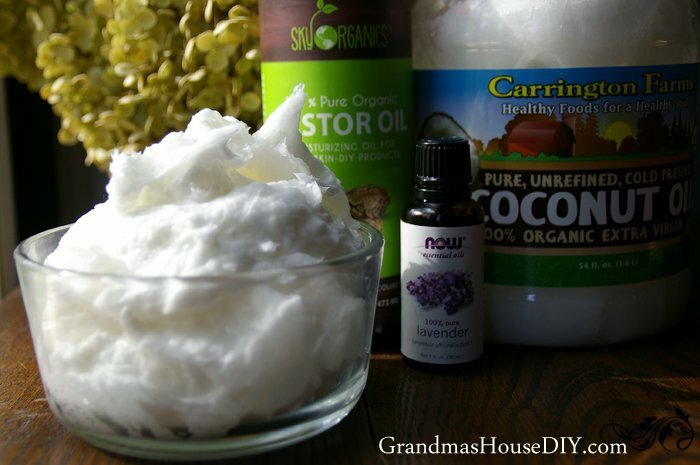 I went looking online and many of the recipes I saw for body butter (or even just homemade DIY lotion) called for ingredients I did not have on hand and then what if I didn’t like how it turned out? Then I would have a bunch of money sitting in a cabinet in ingredients I might not use again! So, after some research I grabbed my tub of coconut oil, my lavender oil and I also happened to have some organic castor oil on hand. I wanted a literal “butter” consistency so I knew I had to “whip” it up. I honestly had no idea if this was going to turn out so I dropped a couple of cups of coconut oil in my mixer, included a dozen or so drops of lavender oil and started it up. As it whipped the coconut oil I slowly started drizzling in the castor oil and OH. MY. GOSH. 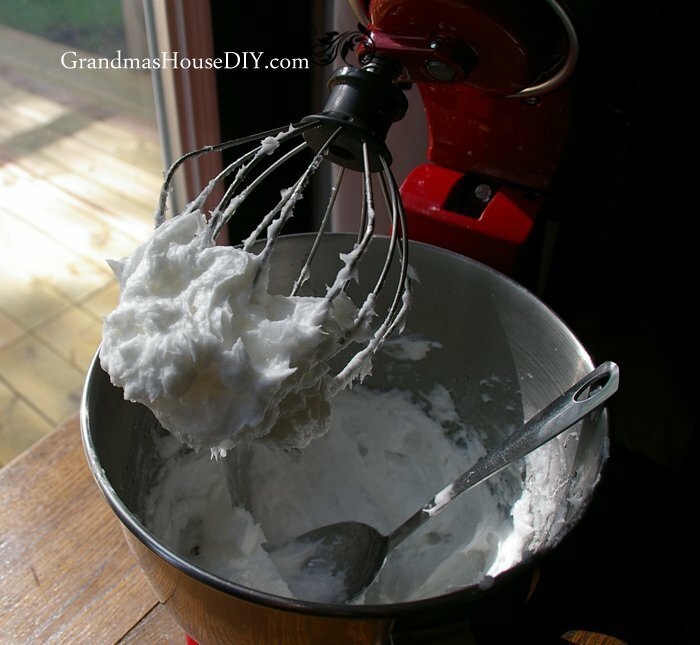 It was like whipped cream made in Heaven! I spread some on my skin and it was SO luxurious! It melted instantly, left no weird residue behind and was surprisingly light and not at all oily feeling! Holy crap guys this is AMAZING!!! I’ve been using this recipe for two years now and literally cover my body with it after I shave my legs or shower, it leaves my skin incredibly soft and it literally smells good enough to eat! My family used to own a golf course and I started mowing there when I was about 14 years old, fast forward ten years and I was still mowing there lol We sold the golf course not too long after that but I learned a lot about my skin in that decade. All summer long I would literally be outside for upwards of fourteen HOURS a day nearly Every. Single. Day. And, at that point, there is only so much sun screen a person can slather on until it just seems silly. (Honestly some of the wind burns I experienced were far more crappy then any sun damage I remember experiencing) I became Pocahontas! I loved my tanned skin and I NEVER once got a sun burn whether I used sun screen or not (of course things have changed considerably now that I’ve been at a desk job for five years lol) my secret was that every day right before bed I would take a really hot shower and SCRUB all of my weather-exposed skin and then heavily treat it with aloe and a variety of moisturizers. Nowadays I am a lot more concerned about what is in my moisturizers and body butters! I am VERY picky about what I am now putting on my body’s largest organ! Now, I use nothing but this organic body butter and I LOVE it. Honestly, this feels like a treat, like a little sneak of dark chocolate after a long day or a glass of wine when I should be drinking water because I’m on a diet. It is hard to believe something so good for your skin can be so utterly luxurious and wonderful! It smells like it too! lol, it feels amazing! Think I’ll make some of this for Christmas gifts! Thanks for sharing on the Pleasures of the NW DIY party! I definitely will be making some for gifts; however, I would love it too and wondered if the lavender hides most of the coconut smell? I love the results of ALL things using coconut oil (just refinished an old chest using nothing but CO) but I detest the smell (and taste) of it. BTW – I love love your website! Hey Traci, yup the Lavender masks it pretty well but you could also try a stronger smelling oil (peppermint comes to mind) to be sure you wouldn’t smell the coconut at all. Thanks for coming by! I would love to make this! I use coconut oil on it’s own every day. Unfortunately, I don’t have a big mixer to whip it up so maybe that’s what I need to put on my Christmas list 😉 Thanks for sharing at Funtastic Friday! Great idea! 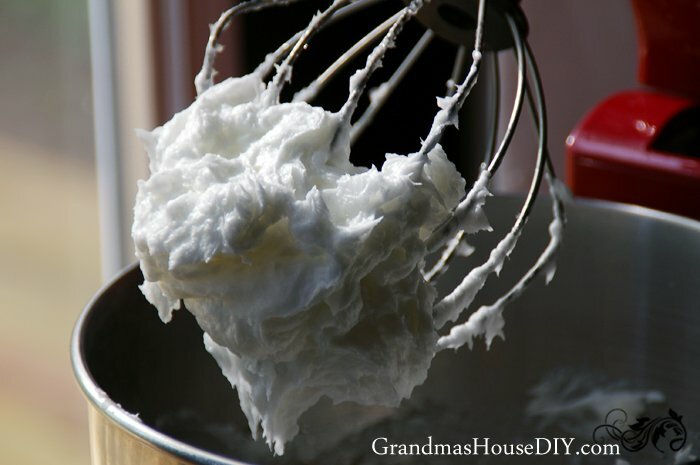 I’m planning on making a few batches for family for Christmas too! Thanks! Sounds wonderful! 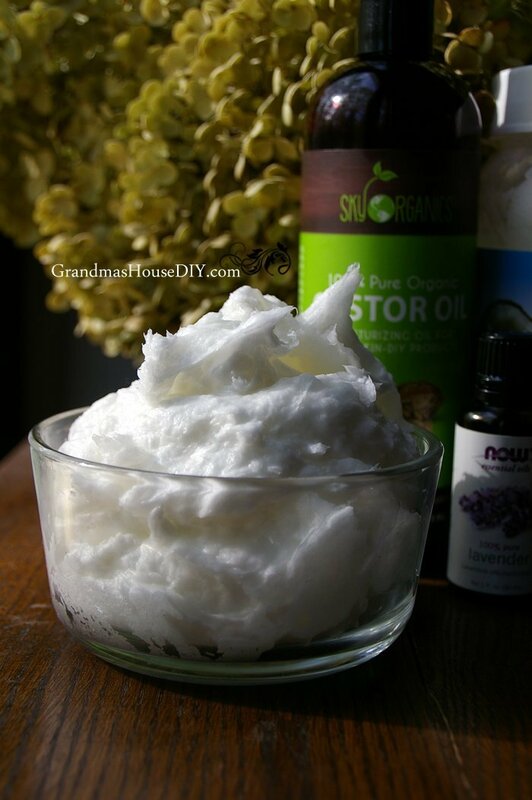 I make homemade lotion and love it too. Thanks for sharing with SYC. I am like everyone else, thinking this would make fantastic Christmas gifts. Do you know how long it will keep? Does it go bad ever? Hi Chloe, last time I made far too big a batch so my stash is six months old and showing absolutely no signs of going bad and it works just as well as the day I made it. I do keep it in a sealed jar though so I bet that helps! This sounds so awesome. I’ve got some coconut oil that’s about to expire for food purposes. Maybe a batch of peppermint body butter is in order for the holidays! Thanks for sharing at the #happynowlinkup! Leslie, that’s a fabulous idea and the peppermint would be good for aches and pains! Carla, now that’s a good question I really don’t know but that would make a certain amount of sense! Ooooo… looks so good and simple! Thanks Rebekah for coming by!! What a great idea. I have all of those ingredients so I might just whip up a batch tonight. Thanks for sharing at the Family Joy Blog Link Party this week! Melissa, it is so lovely I use it almost every day! Thank you for coming by! That looks so healthy and good for the skin. And it feels just wonderful! Thanks for commenting Kathleen and for coming by! It looks so nice, and I bet it does wonders for the skin. Thanks I love using it! This looks so great! I totally want to try it. Love finding good natural products to use. Thanks for linking up at the Friday at the Fire Station link-up. This body Butter sounds amazing Tarah I love that it has three natural ingredients too – I have 2 of them just need to pick up some castor oil and I am good to go !! Hey Amber, I use this almost every day and just love it! I discovered coconut butter a couple years ago. Its all I use because of allergies and skin sensitivities. This recipe is perfect because its all natural and so easy to make. Thanks for the recipe. Thanks Leanna, I use it almost every day and still love it almost two years after I first tried it! 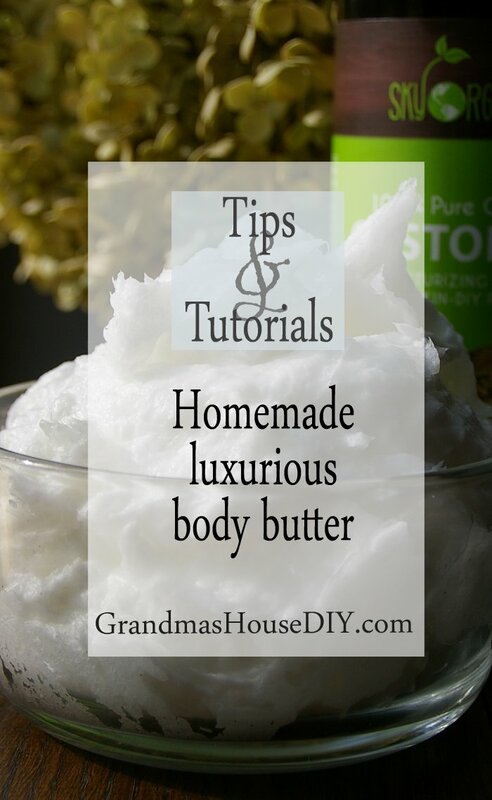 I have been wanting to try a homemade body butter and this sounds wonderful. Can’t wait to try it. This is one of my favorite recipes that I make, I use it all the time! Thanks Tracy! I definitely want to give this a try. Thanks for sharing this with us at the Waste Not Wednesday link party. Hope to see you back again this week. Hey Jodie I’ve been planning on making some scrubs too – maybe for Xmas gifts! Thanks for coming by! Wow!It looks really nice. I can’t wait to make mine.Thank you. Thanks for coming by Stella, have a great weekend! I LOVE this! Thanks for sharing it with us on the Homestead Blog Hop! Sounds amazing, looks really creamy too. Thank you for sharing the instructions at The Really Crafty Link Party this week. Pinned! Thanks for reading and commenting, this is one of my very favorite recipes!